Camera — like a third eye — has also discovered hitherto unknown or unpublicized aspects of the sculptor's genius. The decorative elements are a good example. The total impact of the New Sacristy is so strong that they usually escape notice. The visitor tends to be totally involved with, or even hypnotized by, the great statues, which, within the total concept of the Sacristy, symbolize the heroic struggle between the Temporal and the Eternal. The world Michelangelo conceived for the Medici tombs is a nocturnal world, heavy with sorrow and shot through with horrific and grotesque images. Amendola forces us to look at it as if we are gazing into a darkened mirror or staring into the depth of an abyss. Author's Note: The concept described here was first introduced in the book I had written together with Alexander Zakharov (see: Peter Barenboim, Alexander Zakharov, The Mouse of Medici and Michelangelo, Moscow, 2005). The sculpture of Lorenzo de Medici by Michelangelo from the Medici Chapel has long since been nicknamed Il Pensieroso ('The Thinker'). In spite of the armour covering his body, Michelangelo's Lorenzo greatly surpasses in expression Le Penseur (1880) — the proverbial naked bronze by Auguste Rodin. Officially, the work of Michelangelo depicts Lorenzo de Medici, the Duke of Urbino, who was a military commander, but by no means a thinker. Moreover, Lorenzo was extremely unpopular in Florence. So one soon comes to a conclusion that the statue was actually conceived by Michelangelo in memory of a grandfather of the said Duke of Urbino — Lorenzo the Magnificent whom the young Michelangelo had always revered as his godparent. This Lorenzo really was a thinker, philosopher and poet. Still, Lorenzo the Magnificent was also celebrated as a winner of many a jousting tournament. Furthermore, he was the last representative of the Medici family who had formal control over the Medici European banking network. Yet at the time of his rule, most of the Medici money were invested into the public and cultural life of Florence. As a result, Lorenzo's banking business was gradually declining, while his more than liberal donations and commissions to artists, philosophers and sculptors, including Michelangelo Buonarroti, had largely contributed to his fame and his informal title “The Magnificent”. Tim Parks, Medici Money. Banking, Metaphysics, and Art in Fifteenth-Century Florence, Atlas Books, New York, 2005, pp. 244, 247. [ib.] Raymond de Roover, The Rise and Decline of the Medici Bank, 1397-1494, Beard Books, Washington D.C., 1999, p. 374. The left elbow of the statue of Lorenzo is resting on a small box with an animal head. It is interesting that on a well-known fresco by Luigi Flammingo in Museo degli Argenti in Florence we see Lorenzo the Magnificent sitting in an armchair with his left arm also resting on an animal head. This painting refers to the 16th century, probably it was created already after Michelangelo's death. It is not by chance that the above mentioned fresco opens the list of illustrations collected by Italian art historian Lorenzo Tanzini for his article devoted to the Magnificent. This list ends with the picture of Lorenzo's statue from the New Sacristy with an appropriate attribute to the Magnificient. Lorenzo Tanzini, L'importanza di essere Magnifico, MediovEvo, Settembre, 2005, p. 56. The tomb of Lorenzo Medici. A fragment of the statue of Lorenzo. The small box ends with a mouse-like head (if you look at it from below) either looking out from the box, or serving as an ornament. Many researchers argue, though, that this is a bat's head. I would doubt the fact that Michelangelo, despite some animal images in his works, could be called an “animalist”. Well-known art expert Antonio Paolucci was very correct when he said, “A great animalist is the one who succeeds in understanding and representing, not only the individual creature which is the object of his attention, but the very character of the species which this creature embodies”. This animal head on the statue of Lorenzo was obviously stylized by the sculptor and probably not without a reason. 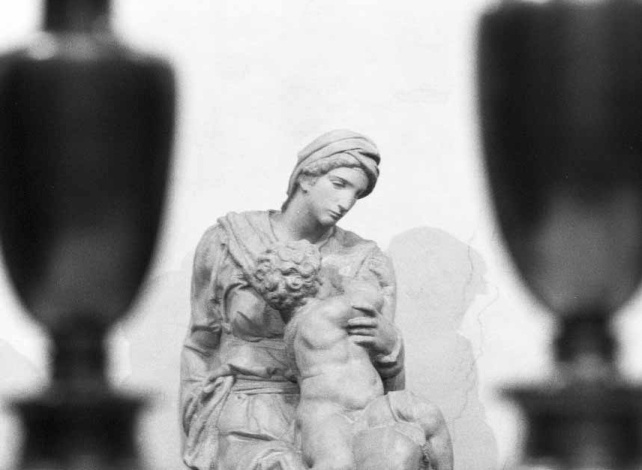 Antonio Paolucci, The Animals of Giambologna, Florence, 2000, p. 5. Michelangelo's pupil Ascanio Condivi, in his biography book about Michelangelo, mentioned that the sculptor wanted to carve a mouse in the Chapel. He wrote, “And to signify Time, he meant to carve a mouse, for which he left a little bit of marble on the work, but then he was prevented and did not do it; because this little creature is forever gnawing and consuming, just as time devours all things”. Ascanio Condivi, The Life of Michelangelo, Pennsylvania, 2003, p. 67. Condivi was not personally familiar with New Sacristy at the time when he wrote his book and, from Michelangelo's words, he described the content of the Chapel as the Madonna and the tomb of Juliano. He did not specify the place where mouse would belong to and said nothing about Lorenzo's tomb and its sculptures. Also, he mentioned also the four sculptures in the Chapel (there is a typo or a translation error in the Pennsylvania 2003 edition where we see “four tombs” as a translation of “le statue son quattro”). We can easily pardon some gaps in Condivi's memory, or maybe, which is more likely, the elderly Michelangelo just did not wish to disclose to the young man all he that had had in mind concerning the Medici Chapel. Maybe the box is not exactly a box but a small block—a bit—of marble which Michelangelo mentioned to Condivi. Using a special camera and custom lighting allows us to see on the resulting picture much more than what a conventional spectator might be able to distinguish — namely, it is another voracious mouth with dangerous-looking teeth on this mouse, making this small rodent look like a monstrous devourer. Edwin Panofsky did not recognize this mouse on Lorenzo statue, probably, because he distinguished between a mouse and a bat — for him these were completely different creatures. He has written a special article entitled The Mouse that Michelangelo Failed to Carve and stressed in another article of his — Neoplatonic Movement and Michelangelo that this was the head of a bat. Edwin Panofsky, The Mouse that Michelangelo Failed to Carve, New York, 1964. Edwin Panofsky, The Neoplatonic Movement and Michelangelo in Michelangelo: Selected Readings, ed. by William E. Wallace, New York & London, 1999, p. 599. In Russian, we have the same word mysh both for mouse and bat, only the latter is called letuchaya mysh (flying mouse). This is because we find these two animals quite similar, especially when it comes to the shapes of their heads. In French, German, and Dutch, the same lexical duality is preserved. It means that speakers of those languages psychologically perceive these two creatures as the same or similar animal. In Italian and English, mouse and bat are called differently, i.e. there they are perceived as different animals. But the similarities are still in place. Albrecht Dürer used the image of a bat (or eine Fledermaus in German) for his famous line engraving Melancholia (1514) that dates back at least 10-15 years before the statue of Lorenzo. Michelangelo both theoretically and practically might have seen a print made from this plate. Condivi mentions that when Michelangelo studied Albrecht Dürer, he found his work to be very weak, imagining how much more beautiful and useful in the study of this subject (proportions of human body) his own conception would have been”. Ascanio Condivi, The Life of Michelangelo, Pennsylvania, 2003, p. 99. However, we have to admit that the above passage from Condivi's memoirs refers to the period at least twenty years after the statue of Lorenzo was completed. Some researchers argue that at least in the early 16th century “flying mouse” traditionally symbolized melancholia. Maybe the influence, which Dürer's engraving had exerted on the future researchers trying to determine the head of what animal they saw on the statue of Lorenzo, was so strong that it overweighed any of their purely zoological considerations. But no matter what approach is taken, there still exists a head of a mouselike animal with a small murine mouth located in a recess, more than a meter above the line of sight of any spectator of average height, so a leonine nose, as well as the second mouth with an appalling set of razor-sharp teeth, can hardly be seen if at all. Is it possible that Michelangelo had intentionally hidden the nose of a lion by placing it up high and by putting the murine mouth into natural shadow? Can it be that he had specially placed the mouse head at such a height as if waiting for the time when people would be equipped with optical and lighting devices, sophisticated enough to see it in its entirety? Vasari, quoting from Michelangelo, wrote that in a thousand years' time it would be absolutely unimportant who resembles whom when talking about the statues of Lorenzo and Juliano. So the Master knew that future generations would care only about the meaning contained in his sculptures. Does it mean that Michelangelo could have encrypted his message until another millennium would have passed and the time for understanding would finally be ripe? Maybe today, only 480 years after his death, it is still early to understand and we are just not ready for it? Panofsky in his article on the Michelangelo mouse quotes from the ancient story of Barlaam and Josaphat, formerly attributed to John of Damascus; the story which may have inspired Michelangelo to consider using the mouse image. Also, he mentioned that this story had Indian origin. Edwin Panofsky, op. cit., p. 243-244. It is important to mention that in 1976, after Edwin Panofsky had died, a great discovery was made in the Medici Chapel. A secret room with the mural drawings by Michelangelo was discovered exactly under the New Sacristy. Some experts still question whether these drawings were made by Michelangelo. Some art critics are taking their time before making full recognition of his authorship; but, as the time goes by, these drawings appear on the pages of art books and albums dedicated to Michelangelo more and more frequently. We completely agree with Charles Sala, who has published several of these drawings with a note that the technique of these drawings witnesses that they had been done by none other but Michelangelo. Charles Sala, Michelangelo, Librero b.v. (Nederlandstalige editie), 2001, p. 128. Speaking about the box with a mouse head, it is more and more frequently regarded as a money box. This assumption commands special attention so long as a money box would be the most appropriate attribute of Lorenzo the Magnificent as a banker; while it would hardly be suitable for his grandson — also Lorenzo — who had died early and was infamous for his notoriously bad rule of Florence. Furthermore, he neither had anything to do with banking nor had he ever been remembered for his exploits in the field of charity. It is worth quoting from Mary McCarthy's witty remark about the two younger dukes, Lorenzo and Juliano, as “the two members of the family who would better have been forgotten”. Mary McCarthy, The Stones of Florence and Venice Observed, London, 2006, p. 40. The money box could serve to ascertain that the statue is dedicated to Lorenzo the Magnificent rather than to his lacklustre grandson. Famous art expert John Pope-Hennesy in his book Italian Renaissance & Baroque Sculpture makes an important point. He writes, “It is often difficult to follow the minds and motives of the great artist and at first sight nothing is stranger than the fact that Michelangelo should have looked for the last time in 1534 at the great statues strewn about the Chapel floor, and then for 30 years refused not only to place them in position, but even to explain how he intended that they should be placed. But his reason becomes more intelligible when we examine the individual sculptures”. How can one prove, however, that the box under the statue's elbow indeed money-related? What does a mouse have to do with it? An unexpected clue can be found in the Orient. We will use the word “mouse”, because on various Oriental sculptures, statuettes and paintings, the mouse, rat, mongoose, or weasel — all look quite the same. A former member of the Monty Python comic band, and now a successful TV series author and writer, Michael Palin, in the hardcover edition of his book Himalaya made a comment on the wall painting he saw on his way to the Taksang Buddhist temple in Bhutan. He writes, “What I thought was a rat was a weasel, seen here disgorging pearls of wisdom”. In the previous paperback edition of his book he wrote about “the curious symbol of a weasel disgorging pearls”. He was told that “the Guardian King of the North Direction traditionally holds a weasel, so anything emanating from a weasel's mouth denotes good fortune”. Michael Palin, Himalaya, London, 2004, p. 257. It might have been a translation error of the local interpreter — and Palin had actually seen the picture of another animal, because in the Indo-Buddhist tradition “the pearls of wisdom”, just as easily as conventional gems, are disgorged by the mongoose attributed to the God Kubera; or, as we can show later, by the mouse (rat) that belongs to the elephant-headed God Ganesha. (Perhaps, the weasel should also be added to the traditionally known list of sacred animals.) It is more important to note that all these animals look very similar on the paintings and sculptures, as we can see it from Palin's passage and from our personal observations of many tanks (icons painted on paper or silk) and statuettes in Nepal, as well as from Oriental paintings and sculptures collected by the world's largest museums, such as the British Museum, Metropolitan Museum and, especially, the Hermitage. Robert Beer writes, “The symbol of a jewel-raining, -spitting or -vomiting mongoose, which produces treasures when squeezed, traces its origin to the ancient Central Asian custom of using a mongoose skin as a jewel container or a money-purse filled with coins, precious stones or cowrie-shells all of which can be squeezed upwards through inside the skin to be finally ejected from the mongoose's mouth”. This author also mentions that mongoose “often gets confused with other small animals”. Robert Beer, The Encyclopedia of Tibetan Symbols and Motifs, Chicago, 2004, p. 212. Looking at the statuette of the “Buddha Mantreya” (Buddha of the Future), dated between 10th and 11th century AD, from the Hermitage collection, we cannot fail to notice that his pose is very similar to that of Lorenzo's statue, only the former has two very small animals under either of his feet. These images reflect traditional Buddhist symbolism, being two deer which on such a small scale look rather like two mice. A full-scale copy of Raphael's Vatican Loggia from the Hermitage creates even more mysteries. Russian Empress Catherine the Great ordered in 1778 to build her a replica of the Loggia created for the Vatican palace by great Raphael Santi and his school in 1517-1519. Raphael had decided to use the motifs and symbols of ancient Roman drawings discovered in the early 16th century in the grottoes and therefore called “grotesques”. N. Nikulin, The Loggia of Raphael at the Hermitage, St. Peterburg, 2005, p. 2. As the result, looking at the Hermitage replica of the Loggia, we can see that Raphael and his pupils had drawn at least four different kinds of mouse (rat) figures. One of them, is fighting a big and dangerous snake, which clearly is typical of a mongoose but not of a rat. We do not know what a mouse (rat) could mean in ancient Rome or in Michelangelo's Florence, but in the memorial house of Michelangelo — Casa Buonarroti — we can see a small old Roman statuettes of Topolino (a small mouse). In the famous Studiolo — office of the Duke Francesco Medici the First in Palazzo Vecchio — we also can see, between other splendid paintings on the ceiling, the image of a mouse- or a rat-like animal located exactly above the entrance. It is difficult to figure out what it symbolized in the past and why its image was placed between the images of angels and beautiful naked goddesses. We will not take the risk of stating that — based on its various features — the statue of Lorenzo resembles Indian statuettes depicting Hindu deities and gods. Some scholars have already pointed at its digression from the European tradition of sepulchral sculpture that had existed before Michelangelo. However, in doing so these experts usually attribute this fact to the innovative approach of the great sculptor. A sketch of legs of Lorenzo's statue gives a better proof of the originality of Michelangelo's approach to the wall drawings in the secret room under the New Sacristy. We may see that on the drawing the legs are not crossed which means that this is not a later copy, but the initial sketch made before the statue. And, of course, we see the sketch of a mouse-like animal on the left side of this drawing. This means that the box, from which this animal looks out or to which it serves as an ornament, was of less importance; and that it was the mouse which really mattered as the most important symbol. Of course, both are meaningful in their own right but when taken together they acquire a synergy of meaning. This is the crucial proof that on the statue of Lorenzo we see the mouse exactly as it was conceived and carved by Michelangelo. We will now try to focus on the image of the mouse which is directly associated with the image of the Hindu-Buddhist God Ganesha who is traditionally depicted with an elephant's head. The mouse (rat) is his vahana — i.e. the companion animal that allows to distinguish this god from other deities. 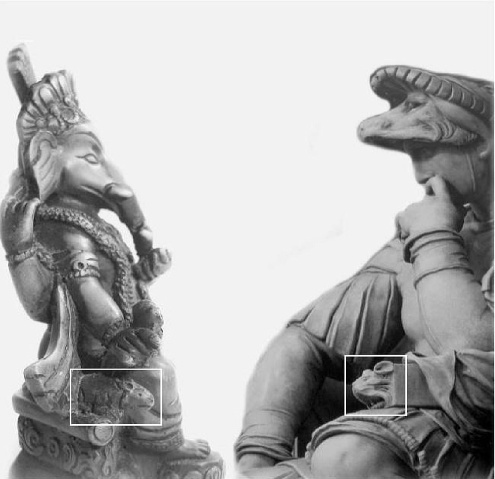 Statues of many Indian gods have their own vahanas for the same purpose, but Ganesha because of his elephantine head is easily recognisable anyway. But artistic depictions of the mouse of Ganesha and the mongoose of Kubera obviously look very much alike. Ganesha is the God of wisdom and success. The mouse serves as his magic vehicle. It can usually be seen under his arm or foot, or (in its considerably overblown proportion) as his carrier. Sometimes, Ganesha holds in his hand a pot filled with jewels (ratna kumbha). We found the statuettes of Ganesha where this treasure pot was seen offered by a mouse. Throughout our stay in Nepal, where the mixed Hindu-Buddhist tradition has been preserved in the same form as it existed in the Hindustan Peninsula one thousand five hundred years ago, we have discovered that, according to the generally accepted belief, Ganesha's mouse merges with (and plays the same role as) the mongoose depicted usually in the left hand of Kubera, the God of wealth and prosperity (his Buddhist name being Jambhala). Both animals produce (disgorge) precious stones thereby symbolising the creator of affluence. Such images may be found on traditional Buddhist tanks — the icons drawn on paper or silk. During our meeting with a former Buddhist monk Lama Tsonamgel who currently owns the famous art painting workshop in Kathmandu, the capital of Nepal, which produces tanks, we have found out that the image of Ganesha's mouse as a symbol of the wealth producer is very similar or even the same to the mongoose of the God of wealth and prosperity Kubera. On the tanks, the mongoose of Kubera (Jambhala) looks much like the mouse of Ganesha (the Tibetan Tsog Dag), and both are seen disgorging jewels. Lama Tsonamgel explained to us that it was a graphic tradition very typical of Nepal and Tibet. Well-known expert on the Medici Chapel, professor of Carnegie-Mellon University (USA) Edith Balas, following Panofsky, suggests that the sculpture of Lorenzo is very similar to the image of the Roman God Saturn. She writes, “The cash box that Lorenzo leans on refers to Saturn's identification as the god of hidden things. Metaphorically, this correlates with Michelangelo's habit of developing encrypted, elaborate iconographies... Michelangelo's success in accomplishing this approach may be judged by the profound mystery that enveils his images — the one that was too deep even for Vasari's or Condivi's grasp, the one that his contemporaries and colleagues were unable to fathom it”. Edith Balas, Michelangelo's Medici Chapel: A New Interpretation, Philadelphia, 1995, p. 67. So we can see that the idea of connection between the statue of Lorenzo and some ancient god has already been discussed. It is important to mention that according to The Encyclopaedia of Tibetan Symbols and Motifs the elephant-headed God Ganesha had lost his original (anthropomorphic) head having been decapitated by the gaze of the planet Saturn”. Robert Beer, op. cit., p. 82. We suggest considering a possibility that Michelangelo, as well, might have been aware of the mouse being a symbol of prosperity and wealth, and that he could have used the images he observed on the Indian tanks or statuettes brought to Florence. Someone may raise a doubt that Michelangelo could hardly ever see any images of Oriental deities. To assuage such doubts, we would like to mention that Indian warriors were visiting Ancient Greece as part of the Persian troops already in 480 BC. Famous British historian Arnold Toynbee in his book A Study of History writes about rat-like gods and mouse images used in Buddhism. Also, in his description of the role of different gods of Hinduism, he makes a reference to a tank dated 5th century AD. Tanks and sculptures from India could have been brought to Italy with other Oriental products, and Michelangelo might have been familiar with them; he could also have met the people who could have told him of Indian sculptures and images on tanks. Later, in the 4th century BC, surving soldiers of Alexander the Great were sure to bring back home from India the statuettes of Hindu deities made of ivory, gold and silver. The Indian-Buddhist tanks had been known in Europe since the 7th century AD, while the bustling trade with India made across the Mediterranean Sea in the days of Michelangelo was very likely to bring to Europe great varieties of Indian statuettes and silk tanks. Socrates was described to engage in a dialogue with an Indian Brahmin, and there is a provoking historical concept according to which Pythagoras had acquired most of his scientific and philosophical ideas in the 6th century BC when he was travelling across India. Incidentally, the distance of the Ancient Greek towns in Asia Minor from India exceeds but slightly their distance from France. Neo-Platonism, which had become the state ideology of Florence during the reign of Lorenzo the Magnificent of the time of Michelangelo's maturity, is deeply rooted in ancient Alexandria of the first century — a large city already known to host the Hinduist and Buddhist communities at that time. We should bear in mind that Buddhism is six centuries—and Hinduism is almost three millennia—older than Christianity. The exchange of pieces of art between India and Europe might have provoked a respective exchange of ideas and artistic concepts that could have laid the basis for discussions at the Platonic Academy in Florence, which might have been attended by the young Michelangelo: especially the discussions with participation of such renowned philosophers as Pico della Mirandola, Ficino, and Policiano. We should also remember that in the Ancient Greek tradition the mouse was closely associated with Apollo and Dionysus, and that ancient Greeks used to refer to India as “Dionysus' sacred territory”. 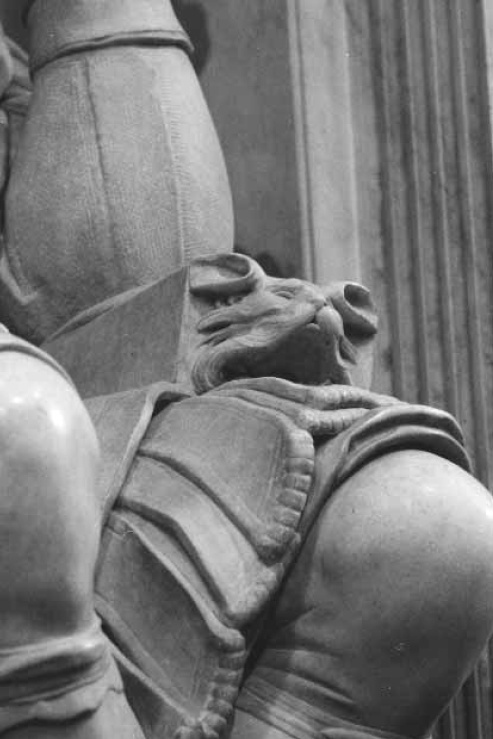 We hope that researchers of the Medici Chapel would pay more attention to the symbolic significance of the mouse-like animal under the arm of the statue of Lorenzo, and that our materials might become helpful in further studies of this matter. The New Sacristy of the Medici Chapel in Florence is the most mystical and mysterious work of art by Michelangelo. For almost five centuries, it has been giving rise to a multitude of different interpretations. This book has been prepared by Peter Barenboim and Sergei Shiyan under the aegis of the Moscow Florentine Society. The authors argue that all three female sculptural images in the Medici Chapel constitute, in fact, a mystical triad that correlates to a similar one created earlier by Botticelli. The authors also believe that some elements of the Hindu-Buddhist culture had indeed influenced the imagery and style of the statue of Lorenzo Medici. The numerous photos taken by Sergei Shiyan inside the Chapel may shed additional light on the views expressed by this book's authors, while allowing the reader to form his own judgment on the matters discussed here. Michelangelo himself said once that for the next thousand years he expected people to continue looking for the true meaning of the Medici Chapel sculptures.